On November 11, KidSpirit Online celebrates its birthday with the 5th Anniversary Fundraiser and KidSpirit Awards Celebration in New York City. Featuring a performance by the World Youth Alliance Chamber Orchestra, remarks by KidSpirit’s Spiritual Elder Award winner Lama Surya Das, and a silent auction, all proceeds benefit KidSpirit’s unique forum to foster dialogue among youth of all backgrounds and faith traditions about life’s big questions. For more information, and to register for the event, visit KidSpirit’s Fifth Anniversary and Awards Celebration event page. Nearly 20,000 spiritually minded readers this year engaged with youth-created content at KidSpirit, an ad-free online magazine and community for youth exploring life’s big questions. These readers come from India and Indonesia and Illinois and many places in between. Most read KidSpirit in English, though a few intrepid souls read it in Chinese, Filipino or Italian. What’s surprising about this online traffic is that it reveals the draw of KidSpirit’s unique editorial focus and the underlying spirituality of the world’s youth. KidSpirit invites young readers and writers, from any background or tradition, religious or not, to share their deepest ideas and creativity with their peers. The magazine is led by an all-youth Editorial Board that meets once a month to edit submissions and decide on its quarterly themes, including Science and Spirit, the Question of Meaning, Ethics and Morality, A Lens on Learning, Money andValue, Change and Loss, and Exploring Humor. KidSpirit writers and editors meet once a month. 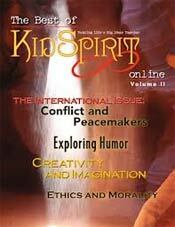 KidSpirit landed on the Internet almost by happenstance. Five years ago, we were a small print publication building a readership through distribution at small bookstores and health food stores. We printed 5,000 ad-free copies on recycled paper for each quarterly issue at a high per copy cost. The hope was to strike a chord with young teens about life’s big questions and to give them the reins in creating a beautiful and probing publication that could become a vehicle for spiritual growth and empowerment. Although we had very appreciative readers, they had no way to actively engage each other about the substantive topics explored in its pages. At the time of the financial downturn, KidSpirit’s Web presence was attractive but no frills. The economic pressures on print media and on the non-profit sector lead us to focus on the uncharted territory of the Web. That shift in course ultimately created a possibility for dynamic interaction among our readers, writers, and editors that would have been impossible only a short while ago. We set out to craft a visually attractive and engaging website with free membership that was safe, ad-free, and would encourage interactivity. Over three years later, the KidSpirit community has grown exponentially. Keeping in step with the ever-changing digital landscape has allowed us to reach an audience well beyond the circulation we could have expected in print. Social media has been a major component of our online strategy. We started by posting on Facebook and Twitter but expanded well beyond those primary outlets to other sites that draw young visitors, including Tumblr, Flickr, and even Pinterest. Posting videos on YouTube has also been an integral part of our online outreach, and targeted use of Facebook ads has significantly increased our visibility. Several adjustments to our site have also helped tip the balance in our Web traffic. We added significant content to our homepage, including a new short column with an international thrust called the Global Beat, which has attracted readers and writers from around the world. We also undertook a key word optimization project and made sure that the back-end of our Web site was meta-tagged. In KidSpirit Online, the Internet has transformed a niche print publication of spiritually engaged youth into a vibrant borderless community. In addition to the striking original work from our contributors, our visitors, ranging from 11 to 17 years old, share their ideas in open comment boxes attached to articles and poetry, send in their own work for consideration, and divulge their inner musings on our Bulletin Board — part of the social networking side of the site. They listen to each other, they reflect, and they dream. This yearning for a slower, more reflective pace led us to augment our online presence with an annual print publication, the Best of KidSpirit Online. This compilation volume, with material selected by the Editorial Board, gives those who enjoy flipping through a book an opportunity to savor the best content of the previous year in a tangible form. Like the website, each volume also includes group guides and activities to help teachers or youth workers lead dynamic discussions. The Internet has catapulted the possibilities for youth to connect meaningfully into a new realm. KidSpirit’s experience shows that the number of kids drawn to exploring deep questions in an inclusive spirit is vast. The ripples from this kind of spiritual exchange are just beginning. We hope that, given encouragement, they will become waves.